Peak Trust Company has donated $10,500 to the Senator Ted Stevens Legislative Internship Program to provide scholarships for University of Alaska students. Overall private donors raised more than $90,500 to fill a gap left by a $57,000 budget cut in 2016. The Peak Trust Company donation will open a new fund specifically in support of scholarships for students enrolled as full-time, unpaid legislative interns. Many students travel from outside Juneau and must absorb the cost of tuition, travel and housing during that time. The scholarship combined with student stipends helps expand the opportunity to students who couldn’t otherwise afford it. For Peak Trust founders, some of the first pioneers of trust laws in Alaska, supporting the program was the right thing to do. The non-partisan program allows students enrolled at the University of Alaska Southeast the opportunity to work in state legislative offices in Juneau during the legislative session while studying public policy that is Alaska-focused. 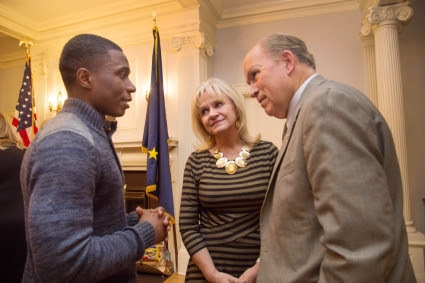 More than 300 students have participated in the program and 40 percent of past participants have been hired as professional staff for the Alaska Legislature. During the session students draft legislation, testify in committees and earn academic credits by participating in a weekly policy seminar. While students gain first-hand experience working with the public, drafting legislation and testifying in committee meetings. Peak Trust Company joined Chugach Alaska Corporation to match a $10,500 gift challenge by the Ted Stevens Foundation this year. The Ted Stevens Foundation has pledged to donate $35,000 a year and renew the $10,500 matching gift challenge for the next 4 years with plans to help the university ensure and expand the program opportunities. To support the Senator Ted Stevens Legislative Internship Program or find out more about how students benefit from private giving, contact the UAS Development Office at (907)796-6320 or go to www.uas.alaska.edu/development.